Welcome to my first edition of Random Ramblings. Remember I said I would be sharing more personal stuff with you all? Well here goes. Hope you like it! *Yesterday, I used my first eyebrow shaver and let's just say it was an epic fail! I had been seeing it on YouTube for years, but never had the nerve to try it until a friend said she uses it. Can't be that bad can it? Not knowing what the heck I was doing, I proceed to shape my brows with this mini razor. I kept seeing little brown strips falling. Uh yeah, it was my skin! Dead mind you, but still skin! My eyebrows really don't look that bad, but they're not the shape I want and they sting. I'm sticking to waxing! PERIOD! *A few days ago, my iron went kaput. You know the feeling you get when you have somewhere to go and you try to iron your clothes, but the thing doesn't work? Yeah, that was on Valentine's Day! I had been holding on to this fire hazard for a while. The "settings" button got stuck on high by some anonymous college student in the house. I won't name names. Anywho, we still used it, that is until recently. I turned it on and I guess it was on too long and started smoking. It set off the fire alarms! I burnt my sheet in the process trying to remove whatever black crud had built up on it. The next time I turned it on I got nothing. Dang it! *Valentine's Day didn't go as I planned it. My hubby and I went to see Ride Along hoping it would lift the mood of our long day. But since I really don't like Kevin Hart, I didn't find it very funny and found myself nodding off to sleep. I think Valentine's Day can be very tricky. The world says that you have to do all these grandeur-ous type of things like expensive dinner, gifts, and so on. A person's expectations can be so high, that the slightest mishap can ruin the day. *I had decided that I really wanted to see the Best Man movies this weekend. When the second one came out in theaters, I had free tickets but didn't go because I never saw the first one. I hate being the only person at the show who doesn't get it, so I passed. Best Man was hilarious and I could wait to rent the sequel! I had read so many reviews and had many friends say the it was very emotional. No one told me it was sad! Oops, I hope I didn't ruin it for you. An-T-ways, I loved it! Definitely worth adding to your movie library. So how's life in your neck of the woods? Shelly I thought I was the only one who went through and an iron every year. Guess they don't make them like they used to. Sounds like your day was awesome! Yeah, I'm so sticking with waxing. Doesn't hurt as much. You are so brave for using that eyebrow shaver!! I don't know if I would ever trust a machine near my face! Yeah, brave is right! But I hear others like using it. Guess it wasn't for me. Eyebrow shavers are always dangerous. I stick to tweezers or have my aunt pretty them up when she cuts my hair. I have strawberry blonde hair though, so it isn't super visible if things are out of place! Wow, they're special shavers for your eyebrows? I've led a sheltered life. Valentines day is something we dont celebrate or make an effort with as hubby is romantic many other days of the year and I think it's too commercial. But we don't ever do a film cos he'd fall asleep. I agree. True love is shown everyday not just on Valentin'es Day. I stick to plucking my eyebrows- for some reason I am scared of having someone else mess with them! 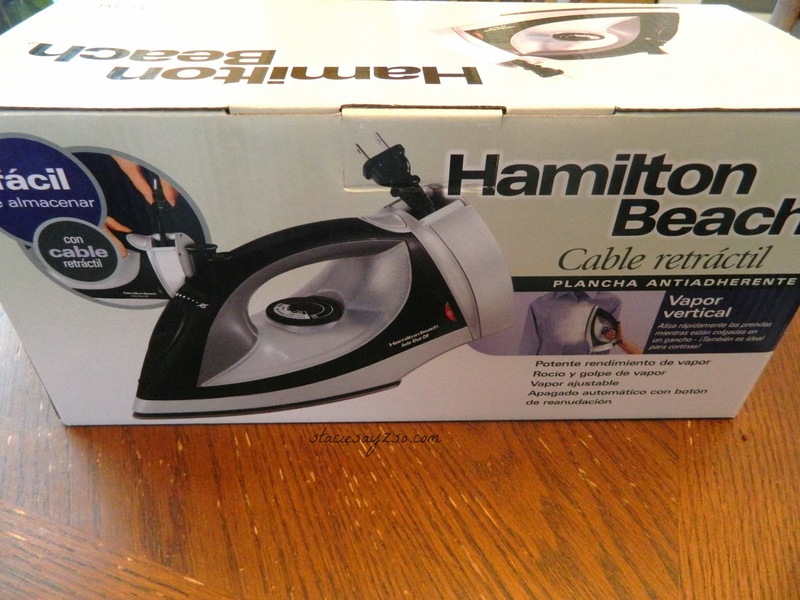 And I definitely need to get a new iron- I have had mine FOREVER and it's sure to start smoking soon, just like yours! I'd love to know what kind of iron you have. Must be a good one! I do my own brows too and I usually do a good job with wax. Thanks to your review, I will be sticking with tweezers, thank you! We've started to focus on Valentine's day as a family day. No need to brave the crowds that day, we can go out another time! It's fun to do heart-shaped pizza with the kids, and make valentines and such. It is hard to manage expectations for such a tricky holiday. So true. I think from here on dinner at home and a DVD will do just fine. Heart shaped pizza sounds good too! I have never heard of an eyebrow shaver?! I would have been too intimidated, so kudos to you for giving it a try. I completely agree about Valentine expectations. I just want to spend time with my husband. We normally go out for dinner and perhaps catch a movie, nothing fancy. Thanks. I'm glad I at least tried it. Now I know what truly works best for me. Sounds like you and your hubby have a great time. Simple and sweet. We don't do Valentines so that takes some pressure off. Your iron story is scary. I get my iron out as little as possible. With eight children I'm always afraid of someone getting burned if I have to step away for a minute. Eight children? I'm sure you really have to stay on your toes. Skipping Valentine's actually doesn't sound like a bad idea. We don't do valentines day. We make a point to treat each other well everyday instead of making a big show one or two days a year. I've never heard of a wrinkle releaser. Were old school around here. My husband still creases his pants. I hate to iron and avoid it when ever possible! I think we have had the same iron for the last nineteen years! You are brave to try the eyebrow razor! I just use tweezers, one day I might give waxing another shot though! I only iron my youngest and my clothes. I'm definitely not the one to sit around all day with an iron. OMG, I've never even heard of an eyebrow shaver. Sounds painful. I'm a big tweezing gal. I don't even want wax on my face. And, our Valentine's Day was totally uneventful. O.k. so I guess I should feel so bad about Valentines Day. I wish I had better tweezing skills. Wax is just easier for me. That's so true! Kids and young lovers. That has given me a new perspective Margarita! I have NEVER plucked, waxed, shaved or done anything to my eyebrows, and I'm 49! I hate to iron, my husband irons more than I do. Valentine's day is a non-event around here since we see it as a waste of money. You are really brave to shave your eyebrows! I also hate to iron and recently have been using a hanging steamer. It works great! I just leave it in the closet and steam whatever I need as I get dressed. Trust me, I'm not doing that again! Using a ganging steamer sounds like it's much easier to use the ironing. I still use the "antiquated" tweezers to shape my eyebrows. I have had them waxed a few times. I have never used the eyebrow shaver, and from the experience you shared more than likely won't. It is fun to try new things as long as they don't hurt! LOL!! Maybe it is that Mercury in retrograde thing..... As long as I have chocolate on every day plus V-day, I am a happy chick! I think I'll watch some tutorials on using tweezers to shape my brows. I'm sure it would work better when I'm pressed for time. I just pluck my eyebrows with tweezers. Works for me! And Valentine's Day was okay. Couldn't do much with a very attached infant who won't let mommy out of his sight. My grandbaby is the same way. My daughter had to tote her along on her Valentine Date with her boyfriend. Husband and I avoid Valentine's Day like the plague - but this year he panicked (in case I was saying I didn't care when I REALLY did!) and bought me a box of chocolates. Hey, you can NEVER go wrong with chocolates! Any day, any time. I'm with the tweezers crowd! Yikes! I did get a great Valentines present though. My hubby got home a day early from his work trip, so he got home on Valentines day. Other than that, he's gone so much we make the days he is home count more than the holidays. Oh that's sweet! Sounds like it was a special Valentine's Day. Especially since he was away at work. I know the feeling about hanging on to sentimental things....sorry about your iron! That iron wasn't sentimental at all. I was just too cheap to buy another one! The eyebrow shaver sounds difficult. I normally just tweeze my own eyebrows and when I feel like splurging I get them waxed when I get my hair cut. Valentine's day was fun. I got to go out to breakfast with my hubby and he surprised me by taking me to see Endless Love in theaters. It was a very cute movie. That was the first day it came out and we went to an 11:05am showing where we were the only ones in that theater so we could laugh out loud without worrying about annoying others. It is very difficult to use an eyebrow shaver. I think if I had enough practice...nah! Breakfast and the early show are a great way to spend quite time and plus it's not as expensive. I probably would have taken off both eyebrows and a good deal of skin with the thing! Life in my neck of the woods is crazy busy as always. Always too many plans, too many "wanna dos" and never enough time! I hear ya! Life can be very busy. Take it one day at a time. I am not a Kevin Hart fan, but still managed to see him on Valentine's Day...only it was with the movie 'About Last Night.' I liked it a lot..i thought it was an appropriate movie for V-Day. My sweetie and I both agree that Hart seems funnier because of his supporting cast mates. It seems like he is EVERYWHERE because we watched NBA All-Star weekend, and BAM..there he was playing on a team...and got MVP (but then he gave it to someone else). Anyways...I want to see Best Man Weekend badly, but will have to wait for the DVD. Someone told my sweetie that grown men were crying in the movie theater, so he didn't feel like being sad at the movies. Lol. Best Man is so good. It's already out on DVD so you should definitely rent it. Oh wow, I thought my Valentine's day was bad. Wowzers! Hope your feeling much better now. Sorry to hear about your eyebrows. I hope they will recover soon! Oh, they were fine the next day. I would be WAAAAY to scared to do my own eyebrows. I get them waxed. Kudos to you for being brave and trying it! I couldn't do it! I love waxing my brows at home. Now I'm sticking to what works. Kevin Hart can be a bit foul to me, but he really wasn't that bad in this movie. We just recently bought an iron. We've been living without one for the last 6 years but hubby decided he needed one to press his uniform for an event. Wow, I could never go that long without ironing. Guess it's a habit. Yeah, I agree about Valentine's Day! You really just have to figure out what works best for you and your significant other and not worry about what everyone else is doing, which is easier said than done. My hubby and I actually ended up going out the following weekend instead, which was great and less crowded! I think that's a great idea. Less expectations when you go out on another day. I pluck my eyebrows, but still trying to figure out how to get that perfect shape! I go through an iron every couple of years. And I only ever get my brows waxed (except for tweezing my unibrow in between waxes). This was a fun post! same here. I have a uni-brow too. Lol! I agree with what you said about Valentine's Day. I hate the pressure people put on their significant others. I always keep my expectations very low. I actually had a very nice VDay this year. The guy I've been seeing surprised me with my favorite (too expensive for me to buy) bottle of wine and some very nice chocolates from a local chocolatier. I've been wanting to share more personal stuff on my blog. I like the format you chose, as well as the title. Thank you Charity. Being more personal in a way is like writing in my journal for me, except, everyone can read it. Hey I heard that there are eyebrow extensions, maybe you could look into them. Irons come and irons go. Good thing it didn't short out your circuits! I'm not one to get my brows waxed. I used to shave them in high school until a knick created a real gusher... and then that stopped. I try to keep up with tweezing, but that;s hit or miss. C'est la vie. Our Valentine's Day was pretty unromantic, too... it's just the way things go sometimes. And I thought I was the only one who hadn't seen Best Man -- it's on my list, but not hubby's so I am waiting until he goes out of town on a conference... then out comes the Netflix! Yikes! Sorry you had such a bad experience with shaving. I would not have been as brave to try the eyebrow shaver! At least you tried. I usually do threading, which is painful but apparently better than waxing for your skin and ends up looking great. Cute idea about random ramblings...sometimes you just need to say what's on your mind. Thanks! I need to try eyebrow threading. I'm always intrigued when I see someone getting it done at the mall. Oh man! What a roller coaster Valentine's Day! Hope things go better next year! I'm not going to allow myself to give into they hype so I'm sure it will be better! Love your post. Since we are in love and share love everyday, we don't do holiday's like Valentine's day. We just shared our love with another couple in need of a retreat so we invited them to rest at our home for the weekend. Becoming love is our desire and is such a great blessing. I enjoyed reading your post sister. Now that's what I'm talking about! Real love, not commercial nor fake love. That's awesome that you open your home to others. I'm sure it was a blessing to that couple.